A playfully contrarian take on the teaching - and learning - of creative writing. ""Unconventions"" is a quirky and provocative miscellany that reveals Michael Martone's protean interests as a writer and a writing teacher. Martone has, shall we say, a problem with authority. His chief pleasure in knowing the rules of his vocation comes from trying out new ways to bend, blend, or otherwise defy them. 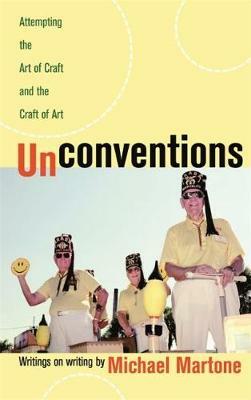 The pieces gathered in ""Unconventions"" are drawn from a long career spent loosening the creative strictures on writing. Including articles, public addresses, essays, interviews, and even a eulogy, these writings vary greatly in form but are unified in addressing the many technical and artistic issues that face all writers, particularly those interested in experimental and nontraditional modes and forms. Martone's approach has always been to synthesize, to understand and use any technique, formula, or style available. ""I find myself, then,"" he writes, ""self-identifying as a formalist, both and neither an experimenter and/or a traditionalist."" In ""I Love a Parade: An Afterword,"" Martone writes about not fitting in - and loving it - as he recalls the time he marched alone in a local Labor Day parade, as a one-person delegation from the National Writers Union. Elsewhere, in writings formally, stylistically, purposely at odds with themselves, Martone's expansive curiosity is on full display. We learn about camouflage techniques, how a baby acquires language, how to ""read"" a WPA-era post office mural, and why Martone sold his stock in the New Yorker and reinvested his money in the company that makes Etch A Sketch. ""Unconventions"", then, is Martone's ""Frankensteinian monster,"" a kind of unruly, hybrid spawn of the mainstream writing enterprise. ""Writing seems to me an intrinsic pleasure, an end in itself first,"" says Martone. ""The question for me is not whether my writing, or any piece of writing, is good or bad but what the writing is and what it is doing and how finally it is used or can be used by others. Throughout the book, the writing reveals a curious mind. Clearly Martone is someone who cares about writing, but also about politics and furniture and architecture and visual art and the history of warfare and family. One of the appeals of Unconventions is the strong presence of an idiosyncratic, individual, original voice. --Valerie Miner "author of The Low Road "
--Janet Burroway "author of Imaginative Writing: The Elements of Craft "
Rich with information and insight, Unconventions is a book for writers to turn to when all the handbooks and guides sound too familiar. Drawing from synapses that seem to fire at double-time, always entertaining as he instructs, Michael Martone offers advice from deep left field, from under stones the rest of us leave unturned, from a three-legged stool in his very own corner of the funhouse. --Peter Turchi "author of Maps of the Imagination: The Writer as Cartographer "
A book of writings on writing that I can only describe as sui generis, both unique and peculiar, which is better than sooey pig or even chop suey . . . generous and inclusive . . . I intend to return to Michael Martone's Unconventions again and again. The author is certifiably unconventional--a young man who truly marches to the beat of a different drummer. . . . A splendid little handbook for writers that is like no other, one that suggests different ways of looking at matters pertaining to writing and different ways of thinking about them; stimulatingly unconventional. Martone sees from acute angles, perceiving what others miss. . . . His stories contain life, served in generous helpings. Three pages of Martone's writing feel as full of experience and detail as whole chapters of other authors' work. . . . His methods in the classroom are intelligent and challenging, and they are everywhere realized in the essay collection Unconventions. . . . [It] records in book form just what a class with Martone can be like, what is at once so engaging and so demanding.